Southern Associates Archives - Southern Associates Enterprises, Inc.
Archive by category "Southern Associates"
Southern Associates Enterprises, Inc. is a Georgia based company has Commercial and Residential experience in designing, building and installing sewer pumps and lift stations for over 13 years. Southern Associates was incorporated in 2003 by company president, Steven Dalton. Dalton is not only the president of the company, but he continues to serve as a Pump Station Design Engineer, Sewer Pump Station Service Engineer and a Licensed Utility Manager. Southern Associates has installed sewer pump stations and water booster stations throughout metro-Atlanta and surrounding areas. Many of these pump stations were also designed by Southern Associates. We also provide pump station start up services, pumping applications engineering, and lift station field service support on sewage pump stations, industrial pump systems, and water chiller and water booster pump stations. Our company has represented manufacturers such as the Pentair Pump Group, Hydromatic Submersible Sewage Pumps, Meyers Sewer Pumps, Ebara Stainless Steel Pumps, Aurora End Suction and Split Case Water Pumps, and Smith & Loveless Above Ground Sewer Pump Stations. Southern Associates handles more than large scale commercial installations and servicing. Some of the pump stations we’ve installed are owned and operated by private entities such as homeowner’s associations, property managers, restaurants, and churches. In order to help these smaller groups, we also provide preventative maintenance service contracts for sewer pump stations. Southern Associates owns its pump station service vehicles as well as excavators and skid steers. Owning our vehicles and heavy equipment gives us scheduling freedom and superior responsiveness for our customers. It also helps us keep overhead down and provide pump station repairs at the lowest cost possible. Southern Associates is committed to our customer’s satisfaction and we fully warranty our work. Our Field Service Engineers are on call 24-hours a day, 7-days a week. Southern Associates Enterprises, Inc. is a Georgia corporation that has been designing, building and installing water booster pump stations and sewage pump stations for over 13 years. We are proud to announce the newest member of the Southern Associates product line – Sulzer / ABS Pumps. Sulzer Pumps recently acquired ABS Pumps, and is a leading manufacturer of submersible sewage pumps. Southern Associates is now the manufacturer’s representative for Sulzer / ABS pumps covering commercial and domestic projects in the State of Georgia. Southern Associates is proud to represent this quality pumping product line. This is an exciting opportunity and we wanted to let you in on the good news. Southern Associates is committed to our customer’s satisfaction and we fully warranty our work. Our Field Service Engineers are on call 24-hours a day, 7-days a week. To find out more or to schedule your project with Southern Associates, call us today at 770-929-0969 or email us at info@southernassociatesinc.com. Southern Associates also provides water and sewer engineering and water and sewer utility construction. SAE specializes in the design, construction, and repair of municipal water and sewer lift stations as well as package waste water treatment plants. Southern Associates was incorporated in September 2003 by Steven Dalton. Steven Dalton is the president of the company, he also continues to serve as a Pump Station Design Engineer, Sewer Pump Station Service Engineer and a Licensed Utility Manager. When it comes to topics of conversation, sewage lift stations and pump station designs are not exactly go-to subjects. However, without these Southern Associates’ products, life and the world around us, would not be quite as pleasant. Southern Associates has been designing, building and installing these lift stations in the state o f Georgia for over 13 years. Southern Associates was incorporated in 2003 by Steven Dalton. Dalton is the president of the company and continues to serve as a Pump Station Design Engineer, Sewer Pump Station Service Engineer and a Licensed Utility Manager. Southern Associates has installed sewer pump stations and water booster stations throughout metro-Atlanta. What is a sewage lift station? According to Wikipedia, a sewage lift stations, or pumping stations, are “facilities including pumps and equipment for pumping fluids from one place to another. They are used for a variety of infrastructure systems, such as the supply of water to canals, the drainage of low-lying land, and the removal of sewage to processing sites. A pumping station is, by definition, an integral part of a pumped-storage hydroelectricity installation.” So basically, lift stations help sewage fight gravity by pumping the contents up and through the network of pipes in order to get to a treatment facility to be treated and processed. Are all SEWAGE pumps the same? Not all lift pumps are created equal. In the design of pump stations and the installation of sewage lift stations, the type of structure, residential or commercial, has to be considered. We’ve not only installed stations for apartment complexes and home residents, but also commercial property managers, restaurants, and churches. Because some of these are owned and operated by private entities, such as homeowner’s associations, we also provide preventative maintenance service contracts for sewer pump stations. Southern Associates is committed to our customer’s satisfaction. We are licensed, insured and fully warranty all of our work. We have an office located in Conyer, Georgia and can be at your site within 2 hours for most locations in the Southeast. Our Field Service Engineers are on call 24-hours a day, 7-days a week @ 404-234-3666. Contact PumpStation Services at 770-929-0969 or email us info@southernassociatesinc.com. After being in business for over a decade, Southern Associates Enterprises, Inc. is proud to announce our partnership with HCP Pumps of America, Inc. Southern Associates is a leader in the design, installation, and field service of water and sewer pump stations and will now be HCP’s representative for the entire State of Georgia. HCP Pumps of America, Inc. has been producing pumps since 1979 but have only been selling direct in the United States since 2005. HCP Pumps manufactures a full line of submersible pumps including non-clog sewage pumps, chopper pumps, grinder pumps, stainless steel pumps, and small discharge vortex impeller type sewage pumps. The field service engineers at Southern Associates Enterprises, Inc. have years of design and engineering experience in installation, service, repair, and monitoring for all types of water and sewage pump stations – including sewer pumps, water booster pumps, raw water pump stations, and effluent pumps. SAE also provides water/sewer engineering and the construction of water/sewer utilities. Southern Associates specializes in the design, construction, and repair of municipal water and sewer lift stations as well as package waste water treatment plants. Along with being a fully insured utility contractor and field service provider, we provide private developers and municipal clients with one point of contact for engineering, DOT, EPD and EPA permitting, budgeting, and construction services. Southern Associates Enterprises, Inc. fully warranties all work and is committed to our customers satisfaction. With this commitment, we are looking forward to bringing HCP Pumps’ standard of excellence to the engineers and municipalities in Georgia. With offices in Conyers, GA we can be at most southeast locations within 2 hours so call us today at 770-929-0969 or our 24-hour service line at 404-234-3666 or visit http://pumpstationservices.com. Southern Associates is pleased to announce that it has has recently completed the Paulding County Sheriff’s Training Center Pump Station project. Before installation could be begin, the site had to be excavated to fit the 10′ diameter by 22.5′ deep precast concrete wet well. Once the pit was excavated, a mobile 160 ton crane was used to set the precast 10′ diameter wet well sections. After the well was installed, the Smith & Loveless packaged pump station was placed on top of the well. Then the electrical conduits were buried and the pump station pad was prepped for the security fence installation and pouring of the 55’x55′ reinforced concrete pad. While the soon-to-be-installed generator was in transit, the security fence and concrete pad were completed. The Generac 150 kW generator was specified with a Class 2 sound proof enclosure because there will be office buildings located close to the pump station. Southern Associates is pleased to announce that it has has recently completed the Acworth Pump Station force main repair project. The force main had a leak approximately 3.5′ from wet well that needed to be excavated, cut and repaired with a solid 2″ sleeve. Because the breaks in both of the pipes occurred during the ice storm of January 2014, we assume they were caused by water freezing in the pipes, even though this seems unlikely. After digging down to the root of the problem, we discovered both discharge pipes were broken between the 90 degree elbows and the exit through the side of the wet well. 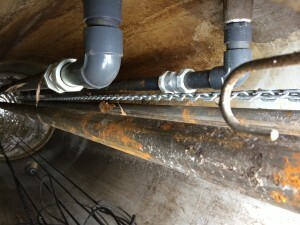 The repairs of both lines were completed by cutting the discharge pipes below the elbows, installing solid 2″ sleeves, and replacing the piping from the below the elbows all the way to the exit at the side of the wet well. Big News for the Dallas Georgia Sewer System installed by Southern Associates Enterprise, Inc.
Southern Associates Enterprises, Inc. is excited to announce that the sewer system for the city of Dallas, Georgia. The new sewer pump station that is being approved by the city of Georgia and the Environmental Protection Division. The construction of the new station is being handled by Southern Associates, which has installed similar stations around the Atlanta area for over 10 years. Currently the plans are for a 60 horsepower duplex pump and pump station with an 8 inch force main. Not only will this sewer pumping station service the new Dallas Industrial Park but it will also have the ability to be connected to several other future developments that have been planned for the area, all of which will share the same drainage basin. For some time now the City of Dallas has recognized the need to revise the specifications for their sewer system, and this new pumping station is a big step in that process. The new station will be able to accommodate the needs of the new industrial park as well as the surrounding areas. Southern Associates will be working closely with the city to make sure that this new pumping station meets all of the needs and specifications that is planned for the area. In addition, the design for this one particular pumping station could also be used in future stations throughout the entire sewer collection system of the city. Southern Associates Enterprises, Inc. has a long history of quality design and service throughout the metro-Atlanta area. Started by Steven Dalton in 2003 the company quickly began to grow. Even though Mr. Dalton is president of the company he still believes in a hands-on approach, which is why he still serves as a pump station design engineer and pump station service engineer. 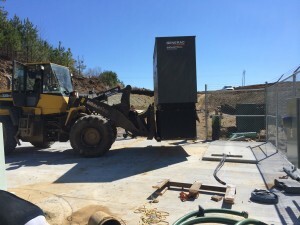 Since 2003 he has installed sewer pump stations for homeowners associations, private businesses, restaurants, churches, commercial properties, and many other new developments throughout Atlanta and its surrounding areas. 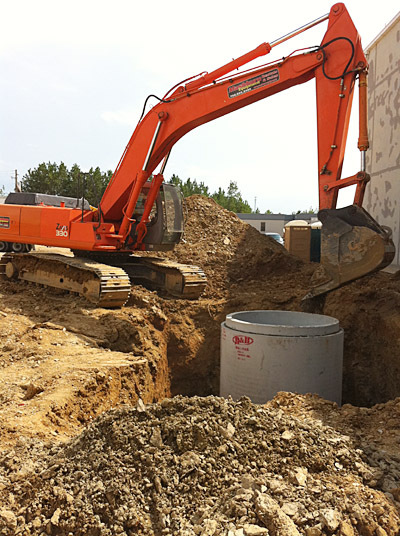 Southern Associates can better accommodate its customers in terms of scheduling freedom and superior responsiveness than its competitors because its owns all of the excavating equipment, skid steers, pump station, and pipeline materials that is necessary for the build. Not only does Mr. Dalton design and supervise the construction of all sewer-pumping stations himself but he also provides a preventative maintenance service contracts for all for his customers. The City of Dallas Georgia is planning ahead for bigger future and Southern Associates Enterprises, Inc. is thrilled to be a part of it. Design of sewer pump station and submittal of the construction plans to City of Dallas and the Georgia Environmental Protection Division for permitting and approval. The Georgia Department of Transportation permits for the force main were previously obtained by Southern Associates in 2006 when the force main was installed. The 60 HP duplex pump station and 8″ force main will serve the new Dallas Industrial Park and potentially several other developments that have been planned within the same drainage basin. The City of Dallas is in the process of revising their sewer system specifications, so we will be working closely with the City during the design to establish requirements for this sewer pump station as well as all future pump stations within their sewer collection system. Project Description: Project Description: Design of sewer pump station and submittal of the construction plans to City of Dallas and the Georgia Environmental Protection Division for permitting and approval. The pump station, force main, and sanitary sewer system installation work began several years ago but was not completed. Work on the project stopped when the sewer pump station was approximately 2/3 complete. Southern Associates has been contracted to compete installation of the sewer pump station, pressure test the force main and repair and leaks, pressure test the sanitary sewer system and repair as needed, and flush the storm sewer of silt, rock and construction debris. Work is scheduled to begin September 3, 2012 with projected completion October 15, 2012. Project Description: Complete installation and testing of sewer pump station, force main, water service, storm sewer, and sanitary sewer system. Atlanta, Georgia – August 11, 2011 – Southern Associates Enterprises, Inc. is pleased to unveil the new, revised layout for the company website atwww.pumpstationservices.com. With its years of experience in the design, installation, and field service of pump stations; Southern Associates is already a trusted name in utility contracting and pump station service. This new online initiative is an attempt to reach out to new customers, more clearly communicating its engineering, construction, and repair services. Customers visiting the website will be able to quickly ascertain the company’s strengths and offerings – from comprehensive design services of large municipal water and waste water systems down to reliable field repair of privately owned sewage pump stations. The site offers an overview of basic pump station designs as well as the company’s credentials. Southern Associates is a Georgia licensed utility contractor. The company owns its pump station service vehicles as well as excavators and skid steers. This allows superior responsiveness and scheduling freedom. With an office in Conyers, Georgia, our field service technicians can be at a job site within 2 hours at most locations in the Southeast. Our Field Service Engineers are on call 24-hours a day, 7-days a week. 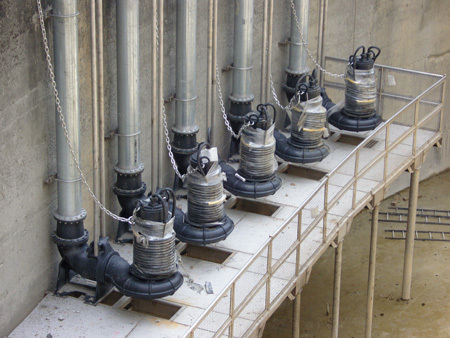 Southern Associates’ design and pump station field service engineers have years of experience in the design, installation, and operation of water and sewer pump stations, package treatment plants, sewage collection, and water distribution systems. We can provide private developers and municipal clients with one point of contact for water and sewer system engineering, DOT, EPD, EPA and municipal permitting, budgeting, and design-build construction services. Southern Associates is committed to our customer’s satisfaction and we fully warranty our work.